At the bottom of the house, at the bottom of a foot locker, at the bottom of a page of newsprint from 1970 were these words. "That's all the Good sports for now," the sign-off to my father's sports column. I can't remember why my brother and I were down in the basement going through Dad's old stuff that day, but reading that kicker, I knew then I wanted to become a sports writer. I even used the same valedictory once when I was a college sports writer, taking a ribbing for using, by then, a rather dated means to close out my own column. Fifteen years later, I'm back behind a keyboard with sports as a weekly subject, although in a bit of a different way, with a bit of a different readership. I absolutely promise not to plagiarize lines four decades old. But today, with your indulgence, this will be a column more about sports than video games, although it's illustrated with the help of one. You see, at the end of this past year, Dad closed a 40-year career in newspapers. He had edited one he started with a colleague in 2007 and, before that, had been publisher of the paper in my hometown for nearly 30 years. If Dad leaves with a legacy, it is one of leading newspapers that insisted on local governments doing the public's business - all of it - publicly, and of holding officials accountable for that, on behalf of those they both served. But on some level Dad's always been a sports writer to me, and more than just because he raised me with an interest in the same sports he loves. It was his first job out of college, where he wrote a column at Winston-Salem's Twin City Sentinel while waiting for my mother to graduate, and it was his duty when they married and moved to the town where I and my brother were raised. Dad went to Elkin, N.C., in the early 1970s to be the editor of its small tri-weekly newspaper. It had no sports editor at the time, so the title also meant he was also its sports writer. Small town newsmen, then as now, must take their own pictures, whether or not they're trained photographers. Snapping broad daylight photos of big fish or check presentations or potatoes that look like Richard Nixon is one thing. The task is infinitely more complex, and critical, when you're covering the nighttime action of high school football in a blanket-mill town where that's the only thing worth reading in a weekend edition. Working for Dad years later, I would confess the mortal fear I had of coming home from a game with no usable art. A strong vertical shot not only anchors a front, it keeps you from writing another 20 column inches just to fill out the three pages that advertising finally booked for you. In my time, we sent color film off to a local 24-hour processor, praying that what came back the next morning matched what was in the mind's eye the night before. When Dad was a sports writer, he was in a darkroom at midnight developing black and white photos off of two-inch negatives himself. And he had a trick to ensure, no matter what, that he always left the game with a magazine-quality image ready for print. With the game all but won, Dad would sidle up to the Elkin head coach, a guy by the name of Harry Jennings, and innocently suggest the Elks run a sweep to their side of the field, where Dad would be waiting with perfect aperture, film speed and flash already set. Inevitably, Jennings would comply, knowing that it would get his players in a big photo and it would make all their parents proud to cut it out. And the picture usually looked like this: the running back coming at you, hard into the frame, driving for the corner, ball tucked, shoulder lowered, throwing out the classic Heisman Trophy stiffarm. Worked like a charm every time, Dad said. I was born in the very early morning on a Thursday in 1973. That year, the Elkin varsity played on Thursdays. After my delivery, Dad took a long rest, got up and put on a tie - newspaper writers, no matter the circulation, always wore ties in those days. Then he went to the old office on Market Street and grabbed his Yashica Mat-124 and several rolls of film, and headed down to Memorial Park Drive for Elkin high school football. There he covered the game from the sideline, keeping track of whole offensive drives, players' cumulative yardage, completions, turnovers, the entire contest seen through his eyes and no one else's. All of this written into a notebook the width of his back pocket. All of this while peering down into a dual-lens box camera he held waist high. 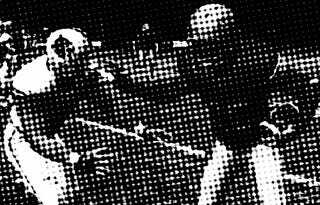 And stripped across the bottom of the front page on Friday, Sept. 28, 1973, the first newspaper of my life, was his story of this game, and his signature photograph: Elkin on the toss sweep, the split end out, patrolling for trouble, the halfback turning upfield to meet the defense, his blue jersey and gold helmet rendered in black and white, arm flung out perfectly in the Heisman pose. And the picture credited to Rebel Good.